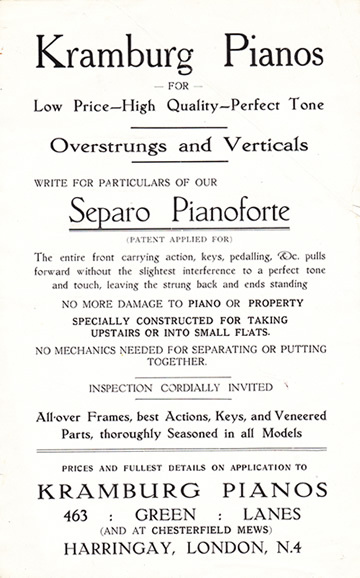 This impressive looking leaflet advertising Mark's piano manufacturing business includes a written description of how the Separo pianoforte was designed. "The entire front carrying action, keys, pedalling, etc. pulls forward without the slightest interference to a perfect tone and touch, leaving the strung back and ends standing." "NO MECHANICS NEEDED FOR SEPARATING OR PUTTING TOGETHER." The word "mechanics" seems rather over the top in this context, revealing a slightly different usage. 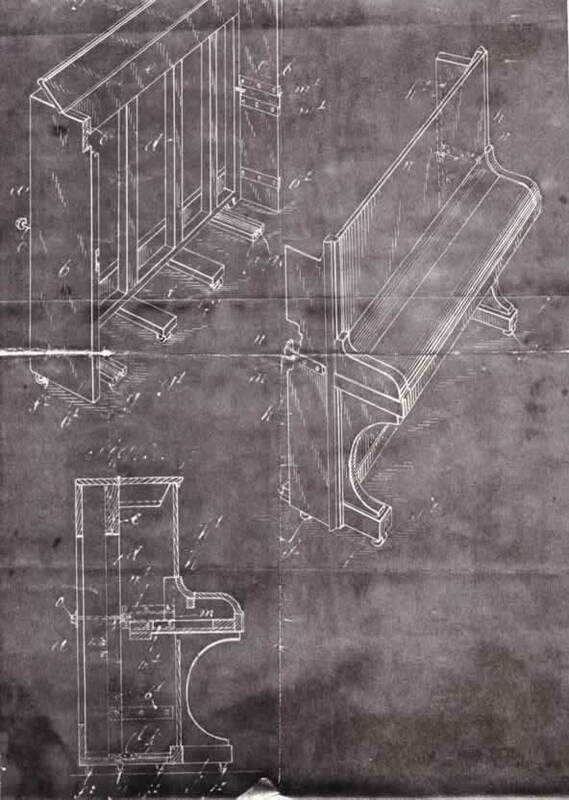 The design for the piano is shown in detail in the blueprint below, which was drawn for a patent application. The inscription at the top reads "A D 1927. Feb. 19. No. 4763. Burgess's Complete Specn. One sheet." Unfortunately Mark had to let the patent lapse when he became seriously ill with pneumonia. 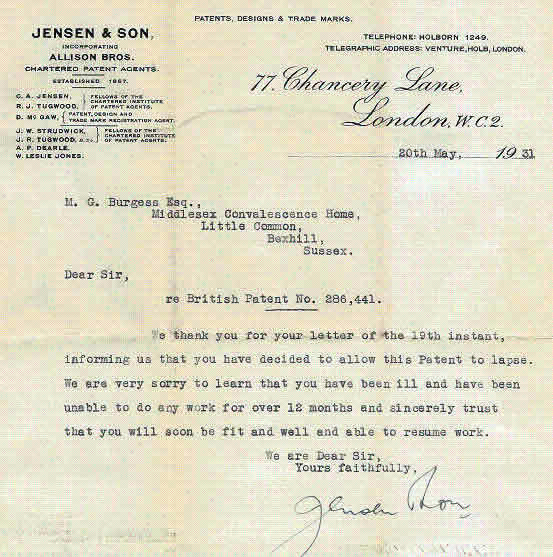 The letter below quotes the patent number (286,441) and gives the address of the Convalescence Home where Mark stayed. He fell ill in October 1930 and was still convalescing over 18 months later. 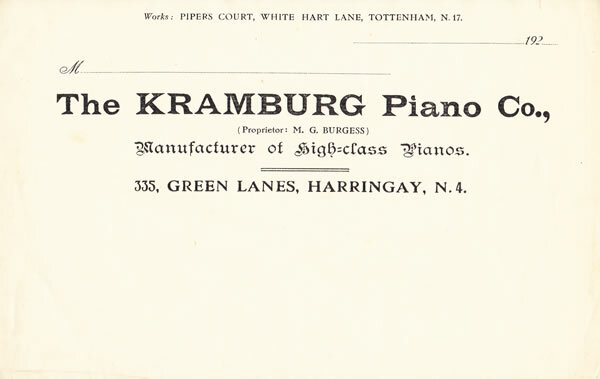 The letterhead below shows the address 335 Green Lanes where Mark lived. Piper's Court may have been an earlier works address, before he moved to Chesterfield Mews, much nearer to home. There is no mention yet of the Separo. For some reason he was convinced that his full name was Mark George Burgess, but there is no official evidence of a middle name. 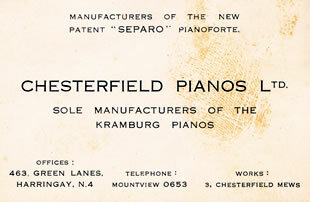 This business card has the later addresses for "works" at 3 Chesterfield Mews and "office" at 463 Green Lanes together with a telephone number. 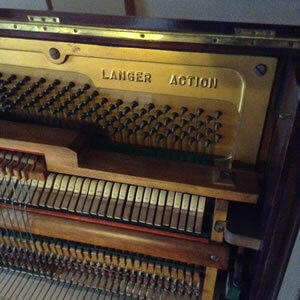 Way back in 1926 a piano action mechanism, serial number 712265, was manufactured by Langer and delivered to Mark Burgess ready to be fitted with a case. It was a basic model, straight-strung and over-damped. Fast-forward 89 years and my nephew Paul spotted it advertised for sale - in Spain. After negotiating its purchase and shipping with the help of Google Translate, Paul finally watched as it had to be squeezed (not being a Separo) through his front door to its new home. 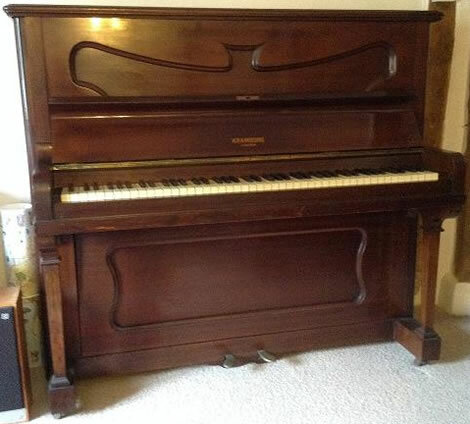 How the piano came to be in Spain is a matter for speculation. Paul bought it from a family living in Villanueva de Castellon, about 30 miles south of Valencia, but they hadn’t imported it. A circular sticker on the right-hand-side of the keyboard lid indicates that it had at some time been sold by a music shop in Valencia called Pianos Roca (Artesania Comunitat Valenciana). As they only started trading in 1940 presumably someone else must have taken the instrument to Spain. Was it exported to be sold by a Spanish music store or did it travel as part of the furniture when a family emigrated or returned home? 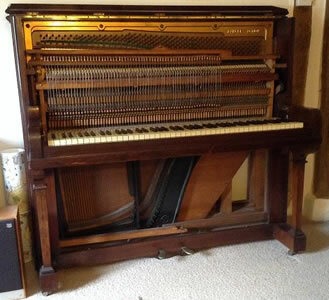 Whatever its history may be, the piano looks remarkably sound considering it has survived nine decades of use and climate, two sea journeys and possibly a civil war. I’m told it is now tuned and needs slightly lighter hands to play it since the let-off was adjusted.